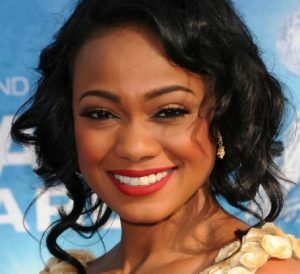 Actress Tatyana Ali, best known by the public for her role as Ashley Banks on The Fresh Prince of Bel-Air. She is also known for her role as Roxanne on the soap opera The Young and the Restless. Tatyana was born to Sonia and Sheriff Ali, in North Bellmore, Long Island, New York, USA as Tatyana Marisol Ali. She is of Trinidad of East Indian descent on her father’s side, and of Afro-Panamanian descent on her mother’s side. She has been married to professor Vaughn Rasberry since July 2016. They have a son together. She attended and graduated from Marymount High School in Los Angeles, California. She earned her a degree in government from Harvard University. *She belongs to Afro-Panamanian and Trinidad of East Indian descent. *Started acting when she was 6 years old. *She is fluent in Spanish, and say some phrases in Hindi. *She was in a relationship with actor Jonathan Brandis since 1996 to 1999. *She is still good friends with Will Smith. *Follow her on Twitter, Facebook, Myspace and Instagram.